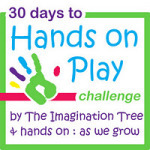 30 Days to Hands on Play Challenge: Music Making! So much noisy fun! We really enjoyed our music making session with household objects! Raid the kitchen cupboards and find some pots and pans, metal utensils, wooden spoons, and anything else you can find of various materials and sizes. Sit down and use them to make some noisy music together! 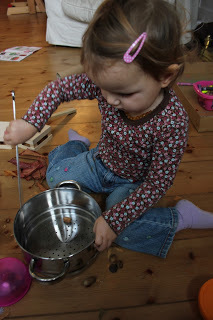 Find some little pots with lids that secure tightly and fill them with rice, pasta shapes or dry beans. 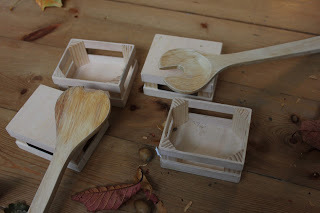 Add these into the fun for some mini shakers! Try a different filling in each one and compare the type of noise that it makes. 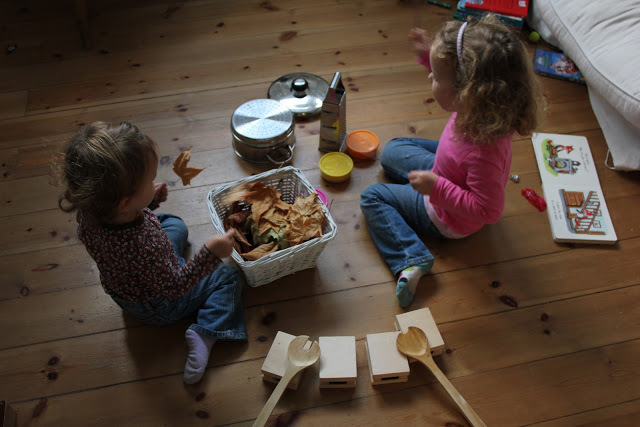 We added a basket of dry leaves for “rustling” which made a beautiful noise in comparison to the very clangy, loud pans! The wooden utensils on the wooden crates made a lovely soft sound and C noticed the difference when playing her instruments. 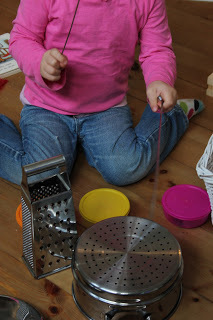 We also tried using a metal skewer to scrape along both sides of the cheese grater, and it made a different sound on each surface which C loved. 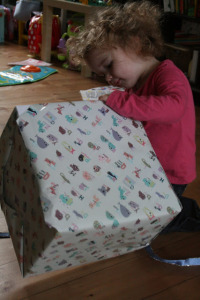 You could try doing this along to your little one’s favourite music CD? What other instruments can you find around the home? Try doing this without using any real instruments at all, for real investigative fun! 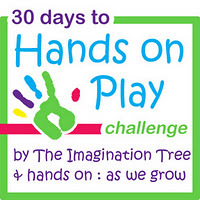 Tomorrow hands on: as we grow will have the challenge for day 20! Cotton Bud Painting on Cards and Pebbles! YAY! For noise!!! Ahem, I mean MUSIC! Hi there! I just discovered your blog and I have been sitting here for over an hour, absorbing all your wonderfulness. I cannot wait to try so many of your ideas and look forward to getting to “know” you more…. look for a blog review on Sunday, I can’t wait to share with all my friends! Love the household item instruments! We had an impromptu music session last week – Daisy initiated it, and it was hilariously cacophonous! Hope you don’t mind me putting the link here as it fits in well with your 30 day challenge. I stumbled upon your blog today and LOVE it! I’m a new follower…thanks for all the inspiration! Thanks Andrea! Will be popping over to say hello! Julia- of course I don’t mind you posting here! Fabulous and just what it’s all about- sharing inspiration!